What? Yeah, I am surprised too. 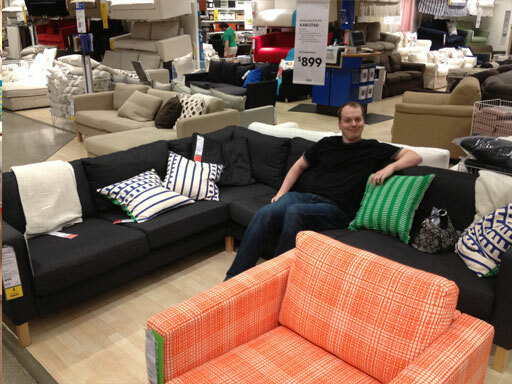 :D Our new Karlstad from IKEA is our first furniture purchase since buying our home two and a half years ago(!!!). On break during work, Jim and I walk through Bellevue Square which has no shortage of extremely expensive couches on display. I’m talking $7500-$12000. Seriously, who spends that on a couch? That’s car territory. But this got us talking about how we’d love a larger couch: one we can both stretch out on, and one that can accommodate a third person so we aren’t stuffed like sardines when Dad comes to visit. So we went couch-hunting at My Home and a few other neighborhood stores. All of these stores wanted a lot of money for their couches, like $3000-$5000. I suppose I could *theoretically* spend that much on a couch, but I don’t want to. A couch isn’t worth that kind of money to me. My last one was $700 and it’s great, just too small. Alas, this is when we realized that Jim and I like very different things in a couch. He wants something to sit on, something with support. I want a mushy bed to melt into. And we both dislike spending more than a thousand or so bucks on this. Realizing this, we shelved the idea again for a couple months. 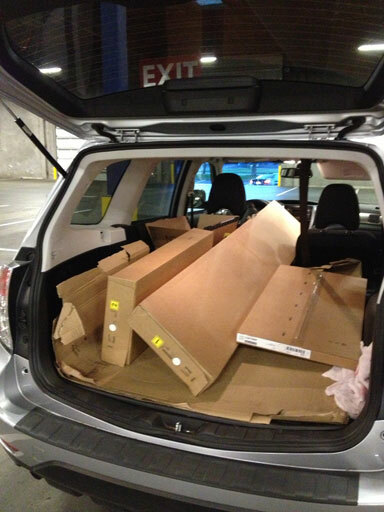 Then we ended up at IKEA to return an unneeded desk leg. We sat on some couches. We sat on Karlstad. It happened. Jim loves it. I love it. We both love its price. $900 for the whole thing? What? How is this possible, IKEA? Don’t you know stores 10 miles north in Bellevue want $7000 for an uncomfortable couch half this size? And that’s about when I realized that Young House Love has the exact same couch and raves about it regularly. SOLD! Karlstad didn’t fit in the Subie so it’ll be delivered Saturday, plus we bought assembly for $39. I’ve never bought assembly of anything before (I even build my own computers!) but $39 seemed like a bargain when weighed against the misery of spending Saturday putting a couch together. We bought a bookshelf to put together instead. December 2013 update: We still adore our Karl couch! The cushions have stayed firm and crisp, and the cushion covers still fit tightly. If I have any complaint at all about our Karl couch, it’s that we both seem to spend more time on the couch now that we can both lay on it at the same time!